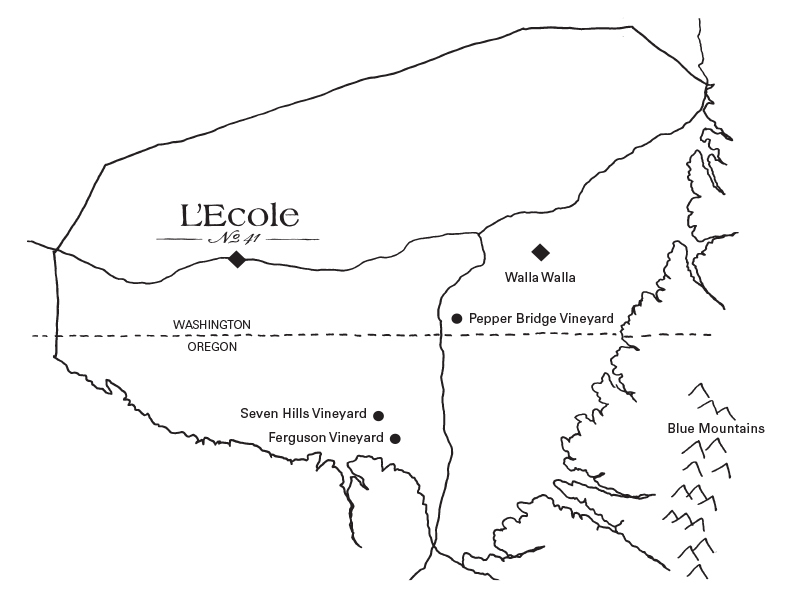 Ferguson Vineyard, named in honor of our founders Jean and Baker Ferguson, is a 42-acre Estate vineyard exclusive to L’Ecole. The vineyard location is a stunning, high elevation site planted on a ridge of ancient lava flows overlooking a panoramic view of the Walla Walla Valley. Approximately 30 acres have been planted so far. The vineyard was planted utilizing biologically diverse sustainable practices and is Certified Sustainable and Certified Salmon-Safe. 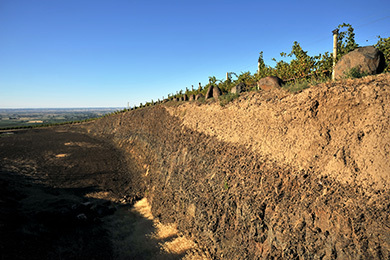 This unique site, comprised of thin loess soil overlying fractured basalt, produces wines with bold, dark fruit, espresso and tobacco notes, high natural acidity, rich texture and excellent structure from the basalt derived minerality. Ferguson has twice now garnered international acclaim. In 2014, the first inaugural 2011 vintage of our Ferguson red Bordeaux blend won the International Trophy at the Decanter World Wine Awards for Bordeaux blends over £15, surpassing the best from Napa Valley and Bordeaux itself. In 2016, the 2013 Ferguson won the International Trophy for New World Bordeaux Blends at the Six Nations Wine Challenge in Sydney, Australia. Ferguson Vineyard is part of the SeVein vineyard development surrounding our Estate Seven Hills Vineyard. This prime piece of ground was strategically selected with an appreciation for the property’s natural strengths. At an elevation of 1,300 to 1,450 feet, the cold air drainage around the site is excellent. Above the ice-age flood silts, the soil is a thin mantle of wind-blown loess overlying fractured basalt. The loess soils at Ferguson are classified as Walla Walla silt loam. At the highest elevation, the soil depth is only 2 to 3 feet, such that the vine roots penetrate deep into the basalt providing a complex array of rich minerals. This rock formation is partially exposed, revealing a quarry of fractured basalt which we refer to as The Ferguson Wall. Mixed layers of multiple lava flows are woven together in a puzzle-like pattern, intersected with veins of calcium carbonate leaching deep into the basalt. This ridge-line vineyard site is windy, putting stress on shoot development and contributing to thicker berry skins. 17.4 acres were planted 2008 and 2009 in a multi-clone mix of Cabernet Sauvignon, Merlot, and smaller quantities of Cabernet Franc, Malbec, and Syrah. In 2016 an additional 12.6 acres were planted in mostly Bordeaux varietals including new clones and the addition of Petit Verdot. An additional planting of 12 acres including Rhone varieties will take place prior to 2020. Our best sustainable farming practices were fully implemented in preparing and planting Ferguson. Two years prior to planting, we grew a series of green crops of spring oats, Sudan grass, Austrian peas, mustard, and arugula; plowing each crop back into the soil. After cross-ripping the entire acreage, we added a complex mix of organic compost and other nutritional supplements to help restore soil humus and minerals. Finally, compost tea and worm castings were added to rejuvenate a diverse mix of beneficial microorganisms enhancing the natural soil biology. Innovative vineyard technology was used to design, map, and plant Ferguson. 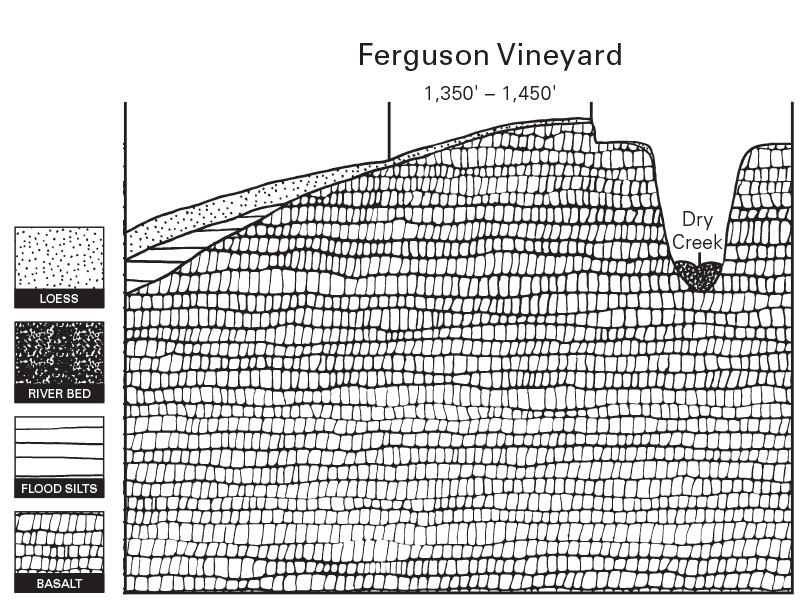 Using three dimensional contour and topographic analysis, detailed slope and aspect were combined with sunlight cycles, wind patterns, and soil characteristics to insure that the vineyard design optimized the growing conditions for each block. A digital map of vineyard blocks was then used to design an irrigation system for building vine uniformity and sustainability. Finally, the actual vine planting utilized GPS technology to engineer precise row orientations and plant spacing. Our first harvest from Ferguson Vineyard was in 2010. Today, Marty Clubb’s primary focus at the winery is a hands-on approach to our viticulture operation. 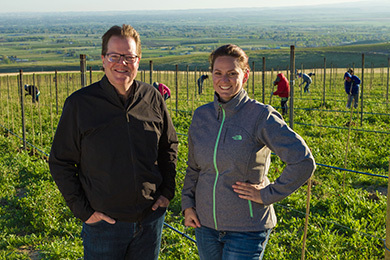 Sadie Drury has been Ferguson Vineyard Manager since 2013. She works in tandem with Marty on all viticulture and harvest decisions. Sadie is a Walla Walla native and a graduate of Walla Walla Community College’s Center for Enology and Viticulture. In 2008, she interned at Ciel du Cheval Vineyard on Red Mountain where she moved up the ranks to become Assistant Vineyard Manager. The Ferguson Wall reveals a quarry of fractured basalt over 30 feet high overlaid with a thin layer of wind-blow, glacial loess.